Hello! I am a scratcher who mainly works on platformers. That's all. Also, I now have 3 accounts my second account is private cus it sucked. but my third account is Connor_Ryder_2 so check it out. For those of you who have not heard of me, My name is Connor_Ryder. I make currently working on the last part of my platformer series, Cubie: The platforming cube. Also, I have just made my new logo! 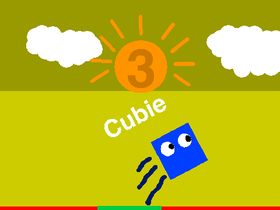 Cubie: The platforming cube| part 3!